Surgery is often an effective treatment option for people diagnosed with cancer. Surgery used alone or in combination with radiation or chemotherapy may also be part of the treatment plan. 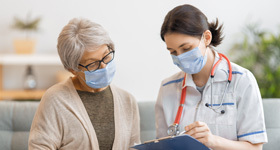 If your cancer treatment requires surgery, the surgeons at Tennova Healthcare are trained in treating the most common forms of the disease and can perform all but the most unusual cancer surgeries. Many of the procedures can be performed using minimally invasive techniques in our specially equipped operating rooms. Physicians Regional Medical Center and Turkey Creek Medical Center are equipped with advanced robotic-assisted surgical systems, which may offer patients less scarring and a faster recovery.